The public prosecutor’s office decided to release Hind, the mother who is accused of neglecting her son’s life by forcing him to stand in an apartment window to sneak into a nearby balcony after she lost the key to her apartment. She wrote a pledge that she would not endanger his life again. 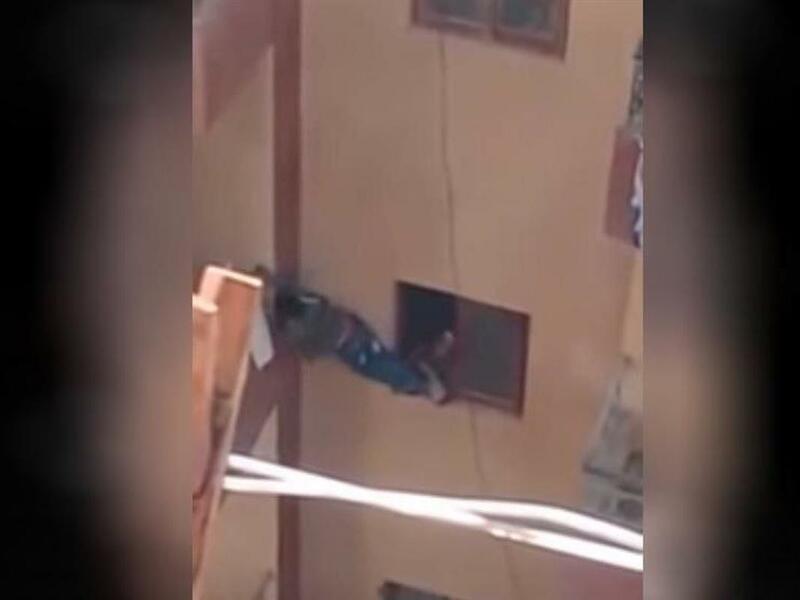 A video went viral on social media showing a woman pushing a child out of the window of a 3rd floor apartment to climb to the 6th floor to get the house keys, as the child was screaming and crying and the neighbors were yelling that he is going to fall. The child was later pulled back inside the house after he was left hanging on another apartment’s balcony. The incident was reported through the child helpline 16000, and the child welfare department of the National Council for Childhood and Motherhood (NCCM) submitted a report to the attorney-general to investigate the video. Following that, security source at the Ministry of the Interior said that the ministry took security measures to determine the location of the woman of the incident. Dr. Azza al-Ashmawi, Secretary-General of the National Council for Childhood and Motherhood (NCCM), thanked Nabil Sadiq, the Attorney-General, the Interior Minister, and the October 6 investigators for their rapid intervention and success in arresting the woman of the “Al-Balkouna” incident. Dr. Ghada Wali, Minister of Social Solidarity, took three urgent actions on the matter by providing all psychosocial rehabilitation services to the child through a specialized ministry of solidarity house to eliminate post-traumatic effects that would result in future consequences for the child. The Minister of Solidarity also stressed the need to discuss the psychological situation of the mother in particular and the family in general in order to protect them from danger and to treat them if necessary, as well as conducting social research for the family to determine their economic and social conditions and the psychological stability of the mother. Lawyer Shaaban Said says that the mother faces a charge of endangering the life of her child, and that if the investigations are proven intentionally to harm the child, she will be referred to the misdemeanor court. However, the mother told the detectives that she did not have the intent to harm the child and was only tired from work, and that she later asked the gatekeeper to open the door instead with the lost keys. The mother and child are now at the public prosecution office for further investigations. The NCCM works in various development areas focusing mainly on women and children such as female genital mutilation, girls’ education, tobacco and drugs, protection against child labor, children with disabilities and handicapped, children at risk hotline and street children. In December 2018, the NCCM succeeded in preventing the marriage of two children in Kafr El Sheikh governorate, after pictures of the children at an engagement party were shared on social media.